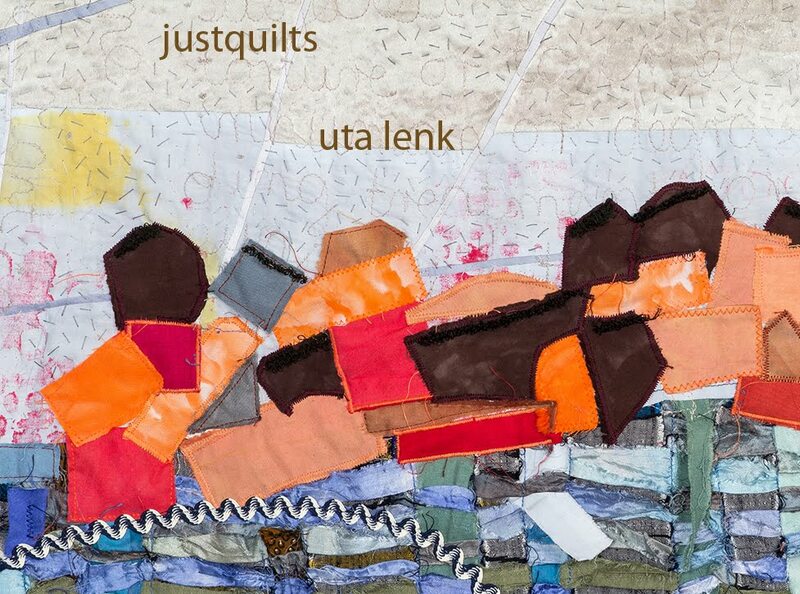 Uta Lenk - justquilts: Where have all the hours gone? 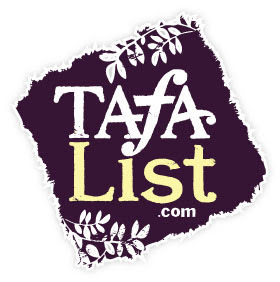 Just in case someone has been wondering: yes, I am still alive, and no, I have not abandoned this blog. It was with dismay that I realized this morning that it has been nine days since my last entry. I haven't been idle for one minute - but what have I been doing? I don't think I've had such good food in a long time! 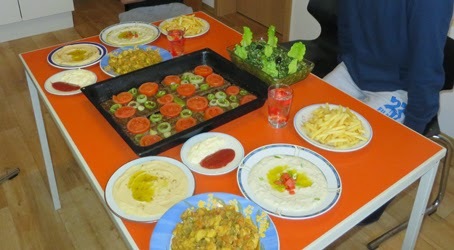 M first real Syrian dinner, cooked by Anas. and played cards with them all. I have learned the Arabic words for green, red, blue and yellow - the color in UNO - and forgotten them again. Learning a foreign language is difficult, indeed. And being confronted with a totally different kind of society, far away from home without a decent chance to go back in peace must be even more difficult. And I haven't even heard any of their stories, right now we are only dealing with day-to-day matters here! Time is even scarcer now than it was before, but I do think this is necessary. But I have been doing things in the textile realm. 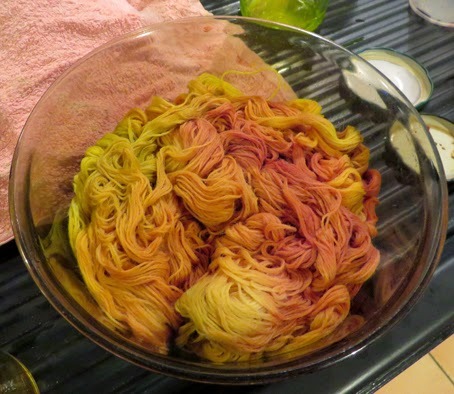 I tried my hand at a bit of wool dyeing, in a friend's studio. Another friend of hers was there , too, and we could easily make out that we are the two most opposite types of dyers you can imagine. 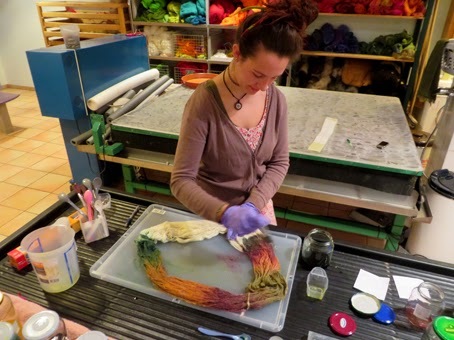 Sophia meticulously painted her skein of wool with a brush, . I, too, had mixed the colours to do that. 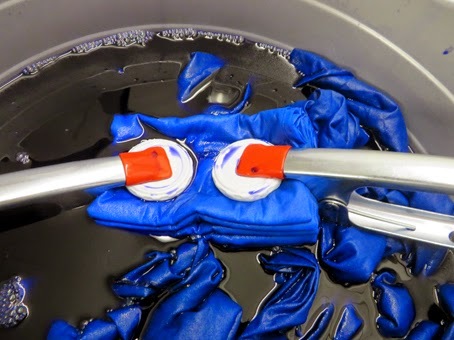 But when I realized that I had made a mistake by adding something like 6 ml of black instead of 3 ml I went 'back' to my kind of dyeing. Put the skein in and liberally pour colour over it - and wait for the surprise result in the end. 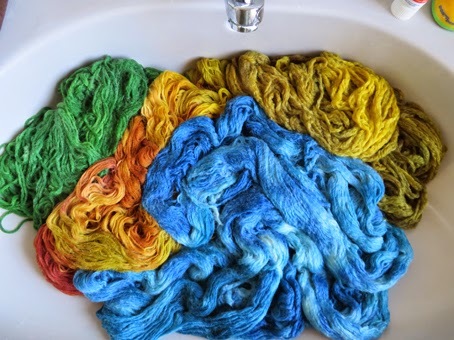 I am still debating with myself whether I should do more wool dyeing or not. My mind keeps changing about it - and I can't say right now what I will do. 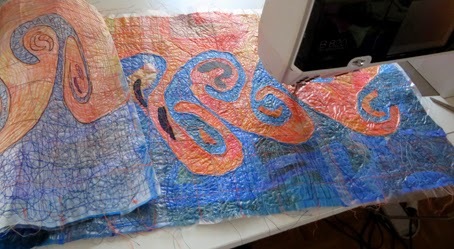 I have also been working on my final piece for the International Threads exhibition in Prague. I am finally doing something in the techniques I learned at the workshop with Jan & Jean last June - and strictly speaking it is not a quilt, as it won't be layered. But I think it is going to be really good, although you can't really tell from these pictures, where the avalon hasn't been dissolved yet. 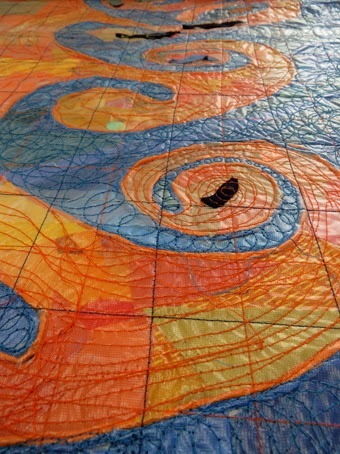 the results of the two clamped and tied pieces can be seen below. I haven't undone the pebbles yet, so don't know the results of those yet. I'm not too thrilled with the two shown above. 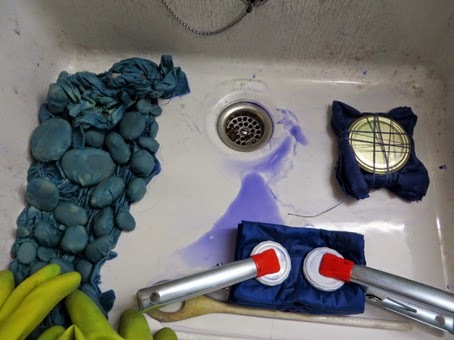 Perhaps my expectations would have been met better if I had used pre-soda-ash-soaked fabric? 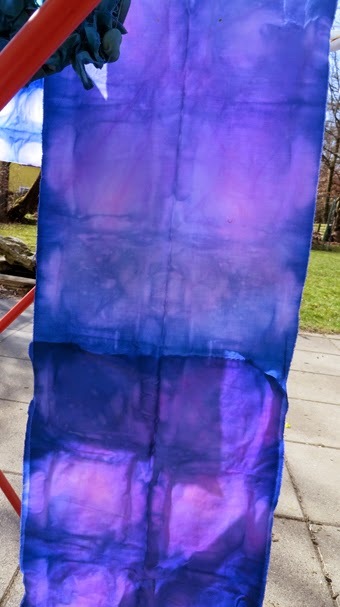 I think I'm getting to the point where I might decide to end my dabbling with shibori... not my type of dyeing! But we'll see. 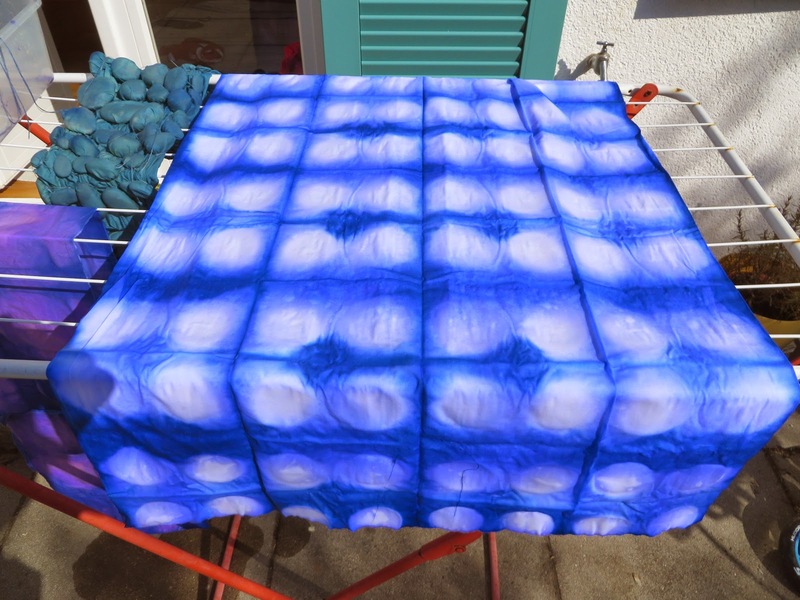 I also photographed all the remaining snow-dyed fabrics from this winter, but as I haven't had a chance to upload them to the website, I won't show any of them here yet. But you could come to Erding, Germany, this Sunday and take a look! No wonder you haven't had time to blog! The volunteer scheme sounds like a really good idea, I can't begin to imagine what it would be like to be in their situation. 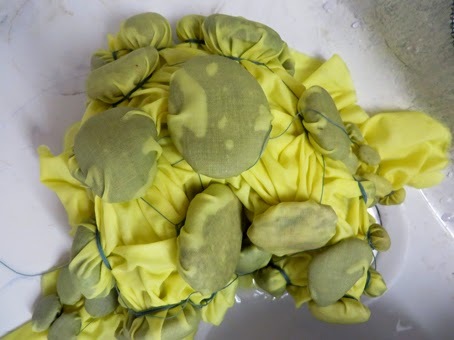 Your wool dyeing looks to have been very successful and there are some very interesting marks on the dyed fabric too. The Prague piece looks so interesting, lots of movement. I also helped foreign people to learn Dutch. It can give a lot of satisfaction. And I love all the colours!! Don't worry about the blogging when there are people who need so much. I am glad you have an opportunity to help. We have collected money at church (very small church) a few different times for Syria and some of the other places where such unfathomable things are happening. It really puts our own lives and 'trials' into perspective. I hope your fabric is very popular at your show! Thanks for the supportive comments on the matter of helping refugees to all of you. Yes, it is much more than teaching the language, although that is a major part to make life here accessible to them. What I really like about it is that I get to know people who are so different from those whom I face here everyday. A bit of international flair!